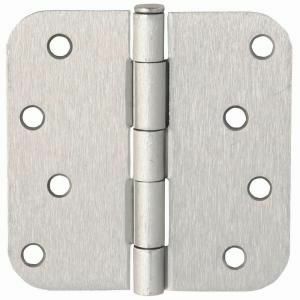 Ideal for use on residential doors up to 1-3/4 in thick. The EVERBILT Continuous Hinge is great for use on folding tables, cabinets, tool sheds, chests and other objects. Made from durable steel. Designed to prevent misalignment. Easy to Install. The EVERBILT T-Hinges are designed for applications with narrow frame or post, such as tool chests, barn doors, shed doors, and gates. Screw holes are staggered to spread out load and to prevent wood splitting. Can be used for left or right hand installations. The EVERBILT Hinge Pin Doorstop is held in place with a hinge pin. The self-adjusting pad makes full contact with the door. An oversized bumper mounted on an adjusting screw protects the door trim.